The longest-running TV series that’s based on a comic book character began on The WB in October 2001. This Friday it’ll kick off its tenth and final season. The Smallville story centers around a pre-Superman Clark Kent. Stories initially revolve around Clark’s home-life, school, and Smallville community but later shifts to his workplace at The Daily Planet newspaper. Ninth series regulars include: Tom Welling (Clark Kent), Allison Mack (Chloe Sullivan), Erica Durance (Lois Lane), Cassidy Freeman (Tess Mercer), Callum Blue (Zod), and Justin Harley (Oliver Queen/The Green Arrow). In season nine, villainous survivors of Krypton attempt to take control of Earth, and Clark must fight the growing danger posed by Zod and his warriors. He gets some help from the shape-shifting Wonder Twins, magical Zatanna, and the Justice Society of America’s Dr. Fate, Hawkman and Stargirl. Amidst the threat of annihilation, Clark and Lois’ relationship takes a romantic turn. Could justice, Earth, and love all survive? The ninth season has just been released on DVD. All 21 action-packed episodes are included on the six DVD set, as well as commentaries on two key episodes, unaired scenes, and two featurettes; Kneel Before Zod! : the Evolution of A Classic Evil Character and Absolute Justice: From Script To Screen, Introducing Venerable Justice Society of America Heroes Into Smallville’s Universe. 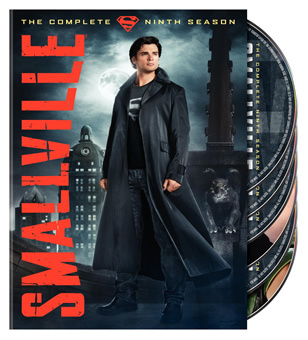 You can purchase Smallville: The Complete Ninth Season for $37.99 from Amazon. You can also try to win a copy here. To enter, you need to merely post a comment below. Be sure to leave your email address in the comment form so that we can contact you with the good news if you win. You can enter once per day. If you’d like an additional chance to win, leave a comment on our Facebook page under the wall post about the contest. If you don’t have a Facebook account, you can email us for another way to enter. Guidelines: This giveaway is open to participants with a United States mailing address only. (International readers can enter if they have a friend in the States who can accept their prizes by mail.) Many may enter but one person will win. You must be 18 and older to enter and no purchase is necessary. Contest ends October 3, 2010. UPDATE: Congratulations to Adam who won this DVD set in our contest. Thanks to everyone who played and we’ve got more contests coming! Clark and Lex. Hope he sticks around. law & order ci should have been cancelled after season 6 by nbc. ratings have plummited after season 5. usa network is finally learning that people are more interested in shows like ncis so go ahead and let law and order ci go off the air after its tenth season. Smallville remains the CW’s best show! I have to say the Smallville season 9 is the best. And i wish that i could win this one. Smallville was always much more interesting with Lex Luger stirring things up. Still as good as it gets on The CW. Last day, but I just wanted to give one last shout to Smallville. This is the best show ever; I’m sad it’s leaving, but glad it’s going out on its own terms. Hooray for the series finale!